Within its stone archways and tiled courtyards, Belmond Casa de Sierra Nevada embodies the spirit of the exquisitely preserved hillside town it calls home. Evoking common labels like "historic" and "charming" to capture the essence of San Miguel de Allende—the birthplace of Mexican independence and a national monument—inevitably fails to convey the depth and breadth of this multifaceted gem. But if you venture just a few blocks from the main square, you begin to comprehend this 400-year-old colonial town's complexities when you encounter the cool courtyards and warm residential feel of Belmond Casa de Sierra Nevada. 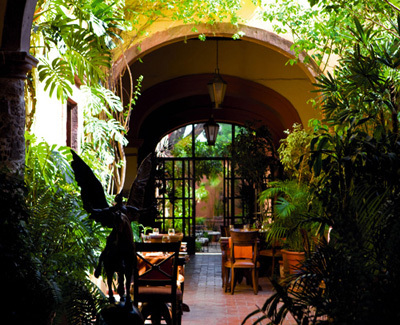 Each of its nine Spanish colonial mansions has been skillfully restored to its original magnificence, from the Casa del Parque, a 17th-century fort-turned-customs-house, to the Casa Principal (Main House), the former residence of San Miguel's archbishop and an official historic landmark. All 33 rooms and suites are individual works of art, capturing the area's rich history in exquisite detail with hand-painted tiles, bovedas (domed ceilings), polished copper sinks, hand-woven throws and rugs, and original paintings by resident artists. If you're reluctant to rouse yourself from your cozy surroundings to dine in the award-winning El Centro restaurant, don't worry—order in and savor its sublime cuisine on your private terrace. When you finally emerge from your luxurious cocoon, San Miguel's celebrated architecture and wealth of cultural offerings await. Strolling the cobblestone streets leads you to art galleries and museums, spectacular churches, hidden gardens, and hip boutiques. Take in a Spanish guitar performance or a bullfight. Immerse yourself in Español at one of San Miguel's renowned language institutes, or master Mexican cuisine at Sazón, Belmond Casa de Sierra Nevada's very own cooking school. Your choices are limited only by the length of your stay. No wonder so many American and European ex-pats now call San Miguel home.